From a tiny hamlet in Normandy to nationwide and then worldwide renown, the Camembert has made quite a journey and well deserves its tag ‘king of cheeses’, as Alison Hughes explains. Camembert – the King of Cheeses! 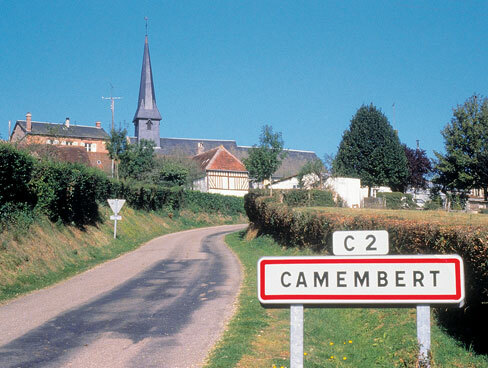 The ‘king of cheeses’ was born in the south of the Pays d’Auge in a small village that bears its name – Camembert. 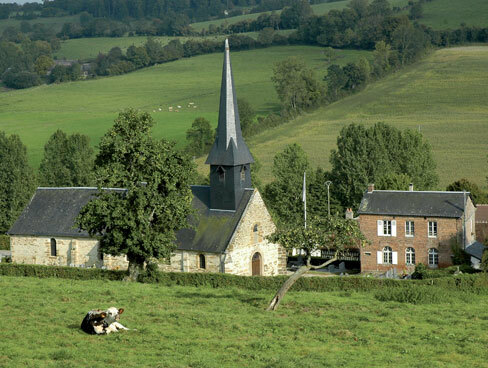 It is no surprise that this lush green area, which straddles both Calvados and Orne, is home to this delicious creamy cheese – good grass and fertile soil make for rich milk, and if you add into the mix a brown and white cow, you have the best raw ingredients for cheese making. Traditionally milk from the Norman breed known colloquially as ‘les vaches à lunettes’ because of their distinctive brown ‘goggles’ was used for camembert, but these days you are likely to see mixed herds of Norman cows and the black and white Holsteins, renowned for their yield, grazing in the fields. Still it is the brown and white ‘cow with glasses’ that is the unofficial mascot of Camembert country and which captures the imagination. The story goes that in 1791 a young dairy farmer’s wife, Marie Harel, developed the creamy cheese from a recipe given to her by a priest fleeing the French Revolution. If you’ve often thought that brie and camembert have similarities then you could be right, as the priest in the story was from Brie. L’Abbé Bonvoust suggested that a rind would help conserve the local runny cheese and enable it to be sold further afield than just the local market. Marie had soon built up a thriving concern, which she passed on to her daughter, also called Marie, who in turn passed it on to her son Victor Paynel. Victor had obviously inherited the family’s flair for business, for in 1863 when Napoleon III was in the area for the official opening of the new railway station at Surdon, he presented the Emperor with a plate of camembert to try. The Emperor loved the cheese and promptly appointed Victor as official supplier to the Imperial Household. With this stamp of approval and the expansion of the railways, camembert became the cheese of all Paris and beyond. In fact, as we know, camembert is now world famous and this is largely due to Etienne Ridel’s invention in 1890 of the characteristic wooden box that meant the cheese could travel far beyond the shores of its native France. It travelled as far as America, where a certain Doctor Knirim found it beneficial in treating patients with digestive problems. He was so impressed with the results that he travelled to Vimoutiers to lay flowers on Marie Harel’s grave. When the rather embarrassed officials couldn’t tell the doctor where she was buried, he suggested a statue be erected in her honour and one was duly erected in Vimoutiers in 1926. Unfortunately, during the bombings in 1944 the statue was decapitated – you can still see it, just behind the church in Boulevard Dentu – and in 1956 a later statue, funded by workers in a cheese factory in Ohio, was erected opposite the town hall. It stands facing another statue, that of ‘Rastifaite’, said to be Marie’s favourite cow, but more likely it was the name of the ‘model’. It should not be forgotten that Vimoutiers was almost completely destroyed during the bombardments. Miraculously the church stood firm, but all its stained-glass windows were shattered. New windows by a master craftsman from Chartres were fitted in the 1950s. They tell the story of Normandy – the Norse invasion, the monks of Jumièges, Joan of Arc and, yes, even a camembert is featured there! For an authentic Camembert look for AOC, lait cru (unpasteurised milk) and moulé à la louche (curds are traditionally ladled by hand). Don’t be afraid to take the lid off a Camembert and try the touch-and-sniff test! Decide how ripe you like it and look at the date. Young: buy one with a long lead-in date; it should be firm to the touch and have a fluffy white rind. Mature: buy a few days before advised date; it should have quite a ‘bouquet’, be soft to the touch and have reddish marks on the rind. 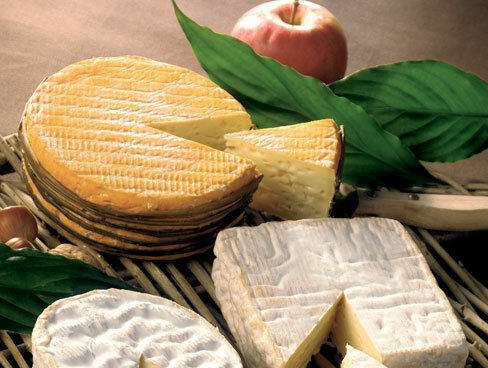 A glass of chilled local cider or a fruity wine is the perfect accompaniment to camembert. During the First World War, soldiers at the front received a camembert in their daily rations – not as a secret weapon, but as a ‘comfort’. Producers sent a whole day’s production to the front lines every week. It is reputed that this helped to spread the cheese’s popularity after the war when soldiers returned to their homes in various parts of l’Hexagone. ‘Tyrosémiophile’ means ‘collector of camembert labels’. 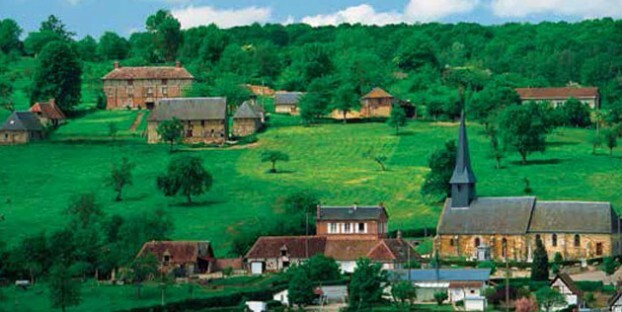 There is an association of tyrosémiophiles who meet annually in the Musée du Camembert at Vimoutiers to swap labels. There are nearly 3,000 different labels on show in the museum. 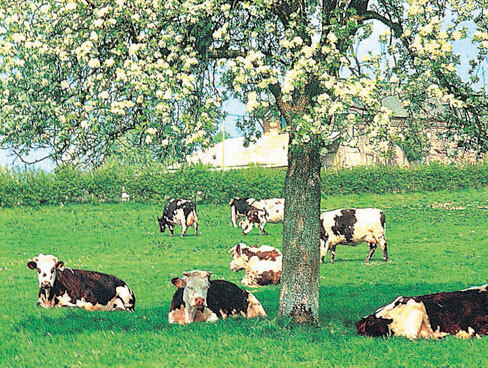 Traditionally Norman cows (vaches à lunettes) were put out to pasture on 17th April. There are only 90 calories in a portion of camembert (one-eighth of the cheese), which is less than many ‘hard’ cheeses, so enjoy!